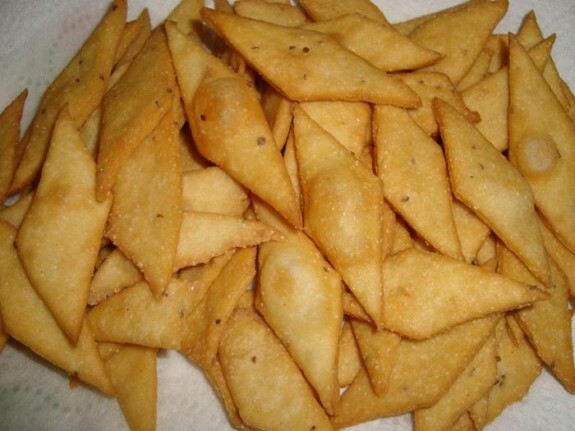 Namak Parry is a very light crunchy snack made using very simple ingredients like flour, ghee, salt and water.Most of the people buy it from bakeries but now you can make it at home with this simple and easy recipe. If you want recipe in urdu so it can also be provided. In a bowl mix flour, salt, pure ghee, cumin seeds or carom seeds and knead it with hot water to make soft dough. Cover the dough and let it rest for 1 hour. After 1 hour take the dough and roll it with rolling pin and make thin chapati and cut it in diamond shape or your desire shape . Deep fry all these namak parry until they turn golden.